A 15 minute boat ride from Cockburn Harbour puts you right over a range of stunning reef arrangements that include walls, swim through reefs, arches and canyons. Some of the best diving is found within the Admiral Cockburn Land and Sea National Park, a natural preserve that includes Six Hills Cay, Middleton Cay and Long Cay. While some local dive shops had to close after 2017’s storms, they are now getting back online to get people back out to the reefs. Not quite ready to head to the bottom of the sea? You can see nearly as much with a mask and snorkel. The advantage of snorkeling is that the equipment is more accessible, there is no need to seek certification and the learning curve is far less steep. South Caicos is separated from the Turks Islands by the 6000 foot deep Turks Island Passage. The water that flows from this passage provides a wealth of nutrients to marine life in the reefs at South Caicos. As a result, there is plenty of bright coral and thousands of tropical fish to see even at the more shallow areas. The crystal-clear water means that there is plenty to see from the surface. The calm water means that there are many areas where you can spend a full day out seeing the reefs, as well as other sights like sunk boats and planes. Colorful tidal channels make their way between reefs and other natural structures. The surface is home to a wide array of native sea birds including cormorants and giant frigates. Anglers are enchanted by the range of sport fishing opportunities available in these rich sites in the area of the reefs. 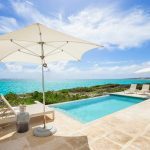 While the area is smaller than the popular Andros Island in the Bahamas, South Caicos has the advantage in many ways. 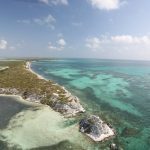 South Caicos has a relative lack of tourists, which means that the reefs and other areas are largely unspoiled. Common fishing targets include shark, bonefish and many more. Properly licensed charters can help you stay out of sensitive areas like national parks. They can also ensure that you have proper licensing in place. More experienced fishermen can set out on their own to enjoy not just reef fishing, but also deep-sea fishing and fishing on the salt flats. The area also hosts a number of sports fishing tournaments each year where competitive fishermen can test their skills. These are just a few of the exciting excursions that Sailrock area luxury homeowners have available just minutes from their home away from home. Talk to your real estate agent or a local guide about the many natural wonders the South Caicos area has to offer.